Austrian Airlines® - book cheap flights » fast & easy! At the beating heart of Europe – Austria is simply teeming with exciting sites and activities to be discovered. From Vienna to Graz to Innsbruck and everything in between, give yourself an unforgettable vacation and explore sites such as Vienna’s Mozarthaus, Belvedere Palace, and Schonbrunn Palace. Hit the slopes in the expansive Austrian Alps for some of the world’s finest winter sporting while observing the countryside from your high mountain vista. With a long musical tradition, Austria has produced everything from the classical sounds of Wolfgang Amadeus Mozart to the Donauinselfest in Vienna, the biggest open-air music festival in the world. Come away to beautiful Albania with Austrian Airlines and discover all that this small Mediterranean nation has to offer. From the white-capped mountains to the warm sandy beaches and crystal-clear waters, Albania has something for everyone. Wander the streets of the capital, Tirana, or hike through the foothills of the Dinaric Alps. Pay a visit to the historic city of Shkoder in the North or Saranda in the South, and explore the numerous castles and Greco-Roman sites that pepper the countryside with old-world charm. A fulfilling journey no matter who you are – Albania is the perfect vacation getaway for families or solo travelers. Rugged landscape, ancient ruins, and cities as old as time – Armenia is the perfect travel destination for anyone looking for something a bit different, and Austrian Airlines can help get you there in style and comfort. Discover Yerevan, the nation’s capital and one of the oldest continuously inhabited cities on Earth. Hike through the foothills and mountains that are so iconic of Armenia, and spend some time basking in the sun beside the crystalline Lake Sevan. With a unique culture, cuisine, and no shortage of modern delights, Armenia is sure to become your next vacation favorite. From unique cuisine such as draniki, to the primeval forest of Puszcza Białowieska and the looming castles, Belarus is a destination to be savored by any traveler. Take to the skies with Austrian Airlines to this fair country, an exciting gem of Eastern European history and mystique. From the cities of Minsk, Homyel, and Brest to the beautiful wildernesses such as Strusta Lake in the Vitebsk Region, there’s something for everyone. In Minsk, the Belorussian capital, you’ll discover the modern National Opera and Ballet Theatre building, and Independence square – popular attractions all well worth the visit! From Brussels to Bruge, and from craft beer to aged gouda cheese, experience all that Belgium has to offer with Austrian Airlines. Take a boat ride along the narrow canals of Bruges, or wander beneath the medieval gates of Kruispoort. Just a short train ride away you’ll discover Brussels, where you can witness the Grand Place market square – one of the largest in Europe. Visit lovely Liege, stay a while in Leuven and view its vast Gothic Town Hall. Sit for a spell at a café in Antwerp – Belgium’s largest city proper. No matter where you’re coming from or where you’d like to go, Belgium has more to offer any traveler than you can possibly imagine. Discover the Balkan nation of Bosnia and Herzegovina with Austrian Airlines and get ready for your next great adventure. Here you’ll find everything from hill-top castles, to vibrant city life, and even a luxurious seaside resort getaway. Experience the diversity and unique culture and cuisine in the capital city of Sarajevo, or spend a relaxing weekend wandering the streets of the old-world town of Mostar. Bosnia and Herzegovina may only have 12 miles of coastline, but the sandy beaches, crystal- blue Adriatic waters, and the fantastic shopping at the coastal town of Neum ensure that you won’t run out of things to do. Make Bulgaria your next travel destination and fly with Austrian Airlines. Visit the mountain Monastery of Rila, relax in the sun or bathe in the waters of the Black Sea coast. Discover the blended culture of the country’s largest cities – Sofia and Plovdiv, and take a trip through time at their history and culture museums. If you prefer to see history up close and personal, take the time to visit the Thracian Tombs of Kazanlak and Sveshtari. Wander through the dense, primeval forest, taking in the sights and sounds of Bulgaria’s wilderness. No matter where your interests lie, there’s something to be discovered around every corner in Bulgaria, and Austrian Airlines is here to help you get there. Fly with Austrian Airlines and come discover what’s waiting in beautiful Croatia. Visit the capital, Zagreb, and see the Croatian National Theatre or Zagreb cathedral – the tallest building in Croatia. Take a train to the Dalmatian coast – one of Europe’s most gorgeous, and walk through the streets of coastal cities such as Dubrovnik or Split and sample their exquisite Mediterranean cuisine. Croatia offers some of the finest wines in Europe and vineyards can be found nearly everywhere – perfect for wine touring. Lovers of medieval and ancient history won’t be disappointed by the country’s castles, such as Dubovac Castle, Erdut Castle, or the Fortress of Nehaj. Back in Split, you can find the Roman ruins of Diocletian’s Palace and to the North, Pula Amphitheatre. Cyprus is an island nation in the Eastern Mediterranean Sea and the perfect spot for your next exotic getaway. Spend your next vacation taking in the sights of the country’s beautiful mountainous landscapes and warm sandy beaches. The perfect blend of regional cultures makes for a stunning array of Mediterranean cuisine that fuses elements of Turkish, Greek, Lebanese and more to create something entirely new. Experience the vibrant nightlife scene in Nicosia – the country’s capital and indulge in culinary wonderment with dishes such as halloumi cheese, sheftalia, or fresh, delicious seafood. Cyprus has all of this to offer and so much more, but you’ll never know if you don’t go! From cities such as Prague and Brno, to smaller scenic towns like Cesky Krumlov, the Czech Republic awaits travelers from all over the world as a vacation destination unlike any other. Take to the skies with Austrian Airlines and come visit this Central European gem for yourself. Prague, the nation’s capital and largest city, is home to countless wonders both old and new and makes for a truly breathtaking sight. Some of the most popular locales include the Charles Bridge, the Prague Astronomical Clock, and Prague Castle. With its rolling hills, the Czech countryside is populated by small, old world villages and cultural gems that provide a delightful getaway for anyone looking to explore a new and exciting locale. You’re in for a vacation to be remembered when you travel with Austrian Airlines to the Scandinavian country of Denmark. Here you’ll discover bike-friendly cities such as Copenhagen, easy to navigate and explore on foot or bicycle. While you’re at it, visit other cities on the Jutland Peninsula such as Aarhus, Aalborg, or Esbjerg by the West Coast. In Billund, you’ll be met with the original legendary LEGOLAND amusement park. Head over to Funen to see Egeskov Castle and the birthplace of Hans Christian Andersen. Denmark is also home to some of the world’s most famous bridges, connecting its many islands, including the truly magnificent Oresund Bridge that links Denmark to Sweden. To say that France is a cultivated country would be an understatement. For artistic genius, culinary flair and historical interest, it is hard to beat. Famously, the galleries of Paris are home to innumerable masterpieces, including those of the French Impressionists. But there are also gems elsewhere, such as the Matisse and Chagall museums in Nice. For a culinary experience, head to Lyon, the country’s acknowledged food capital. You can find Michelin-starred restaurants, homely brasseries and wonderful open markets to browse. But to satisfy a more spiritual appetite, seek out France’s spectacular medieval cathedrals. Chartres, with its stunning rose window, is among the finest. If timber-framed houses, majestic castles, and a vibrant and diverse culture are what you’d call a great vacation getaway, let Austrian Airlines take you to Germany. With some of Europe’s largest cities – Berlin, Munich, or Hamburg – you’ll quickly become acquainted with the wealth of history and modernity that make Germany great. To the south, in Germany’s state of Bavaria, you’ll be surrounded by the glorious German Alps and the traditional culture that has come to define the nation. Munich’s Oktoberfest beer festival is one of the most popular tourist destinations in the country. Relax along the Baltic coast in Germany’s far north during the summer months. Whatever your preferences, Germany has a little bit of everything. Home to one of the oldest civilizations in Europe and while certainly jam-packed with ancient temples, ruins, and other remnants of the past – Greece also has a lot of modernity to offer the cosmopolitan traveler. In Athens, the largest city and nation’s capital, you’ll discover a blend of the old and new with influences that span the city’s millennia-old past. Beyond the city, you can travel by bus to countless other locations around the country including the equally ancient city of Thessaloniki. Hop on ferry out to Crete in the Mediterranean, and visit Heraklion to experience the island’s unique culture and cuisine. With a warm climate for much of the year, Greece is the perfect place to bask on the sun-soaked beaches or trek through the stunning landscapes that define this ancient locale. Let Austrian Airlines whisk you away to a travel destination with something new and exciting – beautiful Hungary. This Central European nation is home to some of the continent’s most striking landscapes, wineries, and countryside castles. In Budapest, Hungary’s capital and largest city, you’ll never run out of things to see and do. Explore everything from the enormous Buda Castle or the famous Chain Bridge, to the spas and parks of Margaret Island. Accessing the rest of the country by train or bus is simple, allowing you to visit other charming cities and towns such as Pecs or Lillafüred – where you can do some spelunking in the region’s caves. With all of this and more, Hungary has everything you’re looking for a in a travel destination. So why wait? The beauty of Italy's historic towns and cities is legendary. The country has some of the most instantly recognisable skylines in the world: the elegant dome of Florence Cathedral floating above a sea of terracotta roofs, the medieval hilltowns of Umbria perching on tcraggy summits, the strange towers of San Gimignano asserting the power of dynasties, long gone. But Italy is doubly fortunate. Its natural beauty and diversity is also astonishing. From the sublime peaks of the Dolomites to the vine-loaded hills of Tuscany, and from the perfect beaches of the Adriatic coast to the majestic lakes of the north, it has long been a subject for poets and painters. If your idea of a perfect vacation destination is wandering through winding valleys and over rolling hills, surrounded by some of the most stunning landscapes on Earth, Kosovo may just have everything you’re looking for and more. Fly off into the wild blue yonder with Austrian Airlines to this small Balkan nation and experience everything from the modernity of Pristina, the capital, to the charming villages nestled along riverbanks under the shadows of snow-capped mountains. A land with a myriad past, the historic architecture of the monasteries and fortresses that date back into antiquity make for some tremendous photo opportunities. So pack your bags, grab your camera, and get ready to experience a place unlike any you’ve seen before. Lovely Lithuania is a favorite vacation destination for travelers all over the world, and Austrian Airlines is confident that you won’t regret making it yours. Visit the capital, Vilnius, with its perfect blend of history and modernity and tour the Vilnius Castle Complex and its Gediminas Tower of the Upper Castle, as well as Cathedral Square and the Palace of the Grand Dukes. Outside the city, you’ll discover no end to beautiful flatlands and lakes and rivers that cut a serene passage through the scenic countryside. During the warm months, Lithuania’s Baltic coast makes for some spectacular sunbathing and swimming opportunities. The Balkan nation of Macedonia awaits the intrepid traveler looking for breathtaking scenery, exciting winter sports, and a blended culture that belies a complex and diverse history that spans millennia. Visit Skopje, the country’s capital and largest city, set against the backdrop of the looming Sar Mountains. A modern city with a vibrant social scene, Skopje fuses this feel with its ancient past. In the Northeast of the country, travelers can partake in some excellent winter sporting at the Osogovo resort. Go trekking, canoeing, rock-climbing or even spelunking in the caves at Matka Canyon, a popular and extremely scenic locale frequented by both travelers and locals, easily accessible from Skopje. Rolling hills, serene rivers, and modern cities underscore the Eastern European country of Moldova. Fly with Austrian Airlines and come see what it is that makes this nation special. Visit Chișinău, Moldova’s capital, and experiment with the local cuisine, or wander the streets of Bender or Tiraspol. Take a day to take in the medieval Soroca Fort or relax on the beaches that line the Dniester river. At Old Orhei, located in Trebujeni, you’ll be met with old cave churches cut straight into the cliffsides. Located in the commune of Mileștii Mici, wine lovers will discover the world’s largest wine cellar, which contains over two million bottles. Adriatic coasts, mountainous terrain, and vibrant towns with more photo opportunities than you can possibly imagine – this and much more can be found in the Balkan state of Montenegro, and Austrian Airlines wants to help you get there in style. Relax along the stretches of Adriatic beach and go for a dip in the warm, blue waters. One of the best places to do this is at Ulcinj, a charming seaside town and popular attraction with old world intrigue. Visit Podgorica, Montenegro’s capital, and the nearby Roman ruins at Doclea, a 2,000-year-old site just 3 km to the north. Trek through the hills and rocky mountains and definitely don’t forget your camera. From the canals of Amsterdam to the port of Rotterdam and the Peace Palace of The Hague, let Austrian Airlines whisk you away to the beautiful Netherlands in style. Tour fair Amsterdam by bicycle on some of the most bike-friendly streets in the world, and explore at your own pace. Or, if you want to spend some time outside the bustling cities, try visiting the southern regions, where you’ll find enchanting tulip fields, and the classic windmills that are so iconic of the Netherlands. If you’re simply looking to relax a spell, during the warmer months there is no place better than the sandy beaches along the English channel – also a perfect place to catch lovely sunsets. Take to the skies with Austrian Airlines and discover all that Norway has to offer. From the Arctic city of Tromsø, dark for much of the year, where you can easily view the glorious Aurora Borealis, to the lovely cities of Bergen and Stavanger in the South, where you can find some exquisite seafood dining and easy access to the country’s countless fjords, Norway is the travel destination of a lifetime. Broken by snaking fjords that line the western coast, and overlooked by the high vistas of sites such as Trolltunga and Preikestolen, the rugged and mystifying landscape is a true sight to behold. The capital of Oslo is home to both historic forts and ultra-modern structures such as Oslo Opera House. During the warmer months, you can even go for a dip in the fjord at one of the city’s artificial beaches. From beaches in the North to mountains in the South, the Central European country of Poland awaits with all of its splendor and vibrancy. Relax on the beach, go for a dip in the Baltic Sea during the warmer months, or wander the beautiful valleys and rolling foothills in the shadow of the Tatra Mountains. Revel in the old-world charm of Poland’s large cities such as Krakow, Warsaw, the capital, and Szczecin, near Germany. Not far from Krakow, you can find what remains of Auschwitz, a reminder of a past not to be forgotten. No matter your interests – whether you’re traveling solo or with the entire family, let Austrian Airlines help get you where you’re going. Come fly to beautiful Romania with Austrian Airlines and prepare for everything from sun and sand to white-capped mountains and hidden waterfalls. Revel in the vibrant social scenes of Bucharest, the capital, or Constanța by the Black Sea. Historic sites throughout the country well worth a visit include Bran and Corvin Castles, as well as the Black Church in Brașov – always deserved of a quick stopover. Back in Bucharest, indulge in unique culinary delights such as mustard soup, cozonac, or delicious baked pumpkin. Other popular attractions around the country include the Sphinx of the Bucegi Mountains, the Vălul Miresii waterfall in Cluj County, and the Iron Gates – a large, picturesque gorge that frames the Danube river. As is befitting of the largest country in the world, the Russian Federation has much to offer the adventurous traveler. From the enormous cities of Moscow and St. Petersburg with their minareted churches, to the windswept steppes of Central Asia and the countless cultures that call them home, Russia is a serial explorer’s dream. Tour the Golden Ring – a series of cities northeast of Moscow that feature some of the oldest settlements in the country, and are central to the nation’s history. From grand palaces to spiraling skyscrapers, Russia’s cities are truly a sight to behold. So visit Russia with Austrian Airlines and get ready for the vacation of a lifetime. A land of looming mountains, broad plains and winding rivers, the beautiful Balkan country of Serbia is the perfect site to plan your next vacation getaway. Visit the capital city, Belgrade, and explore its numerous cafes and shopping opportunities such as those located in the Knez Mihailova zone. Visit Novi Sad with its Petrovaradin Fortress dominating the city skyline. Head out into the wilds and visit the Balkan Mountains or the Iron Gates gorge on the Danube river. On the border with Bosnia and Herzegovina you can find the beautiful Uvac Gorge overlooking the meandering river below and a wildlife refuge – perfect for hiking. In Southern Serbia you can hit the slopes and do some winter sporting at Kopaonik. A land of unparalleled beauty and opportunity for outdoor activity, Slovakia is a true gem of Central European history, culture, and scenery. From the modern bustle of cities such as the capital of Bratislava, to the peaks of the Carpathian Mountains, and the medieval castles that still pepper the countryside, no traveler to Slovakia will return home without memories that will last a lifetime. Some of the most popular attractions the country has to offer are its numerous caves. These include the Dobsinska Ice Cave, Bystrianska Cave, Belianska Cave, and many more. Spend a warm summer day exploring Spisske Podhradie, a small town at the foot of Spis Castle, one of the most historic and iconic medieval sites in the country. Let Austrian Airlines whisk you away on your next adventure. Few places on Earth provide a more diverse array of landscapes, experiences, and architectural wonders than Spain. Come visit Iberia with Austrian Airlines and explore Spain from the Basque Lands in the North to Andalusia in the South. Experience the Atlantic coast as well as the Mediterranean Sea and sample some of the finest cuisine in the world. The Andalusian cities of Seville, Malaga, and Jerez contrast brilliantly with more northerly regions such as Barcelona, Madrid or the Galician coast. Whether you’re seeking the palaces and castles that dot Almeria, the historic Islamic architecture of Granada, or the white sandy beaches of Valencia, there’s something in store for every traveler. If viewing the aurora borealis is on your bucket list, Sweden is the place to be. Come fly with Austrian Airlines and discover the majesty of the Scandinavian Mountains, the winding rivers and dense taiga. Pay visits to Stockholm, the capital, to Malmo, and Gothenburg in the West, and to the distant, mountainous terrain of Northern Scandinavia, where you can find not only stunning landscapes, but also an extended season for winter sports. In Stockholm you’ll find a city straddling the crossroads of the old and the new, with contemporary structures such as the Ericsson Globe and the Hotorget buildings, alongside historical structures such as the Royal Palace and the traditional Old Town. Surrounded on all sides by the glorious Alps, the mountainous nation of Switzerland upholds its reputation as one of the most scenic countries on Earth. From its legendary chocolate to its historic architecture, fused elegantly with a modern urban scene in places such as Zurich and Geneva, Switzerland is perfect for travelers of any stripe. Hit the slopes in the snowy Alps, or go for a dip in Lake Geneva. Sit and relax for a while in a café or restaurant in Basel – which sits at the border of both Germany and France, making it the perfect location for further exploration. Your tour of Switzerland is guaranteed to be a trip to remember, and with Austrian Airlines the journey begins in the skies. Ukraine’s capital city, Kiev, boasts two UNESCO world heritage sights: Santa-Sophia Cathedral and the Pechersk Lavra. This is a monastery that was founded nearly 1,000 years ago, at the birth of Ukrainian Christianity. Its gold domes rising above the city’s skyline are a glorious sight. Underneath the monastery is a labyrinth of caves, where monks of centuries gone by lived and prayed. The city of Odessa, on the Black Sea represents another side of Ukrainian tourism. Sandy beaches, cycle paths and spa resorts offering treatments make this a great destination for a wellness break. Explore the United Kingdom with Austrian Airlines from the Cliffs of Dover to the Orkney Isles. Cruise around London in an iconic red double-decker bus, taking in the sights and sounds as you pass by Big Ben, Buckingham Palace or the Tower of London. The towns of Cambridge and Oxford are but a quick hop away. Visit Scotland with its lochs and rolling highland hills, or stop by beautiful Belfast in Northern Ireland. In Wales you’ll find the town with the longest name in Europe, but we’ll just call it Llanfair PG. Spend a weekend relaxing on the beaches on the English Channel or checking out the standing stones of Stonehenge in Wiltshire. Austrian Airlines flies to the Iranian cities of Tehran and Esfahan. The two could not be more different. The capital, Tehran, is nestled in the foothills of the Alborz mountains, with ski resorts within easy reach. The season lasts from mid November to mid May. The city itself is modern, bustling and full of lively cafés and restaurants. By contrast, Esfahan reflects the glories of Iran’s past. One of the highlights is the Sheikh Lotfollah Mosque, with its exquisitely tiled dome, façade and interior. But Iran is a country of surprises, and in Esfahan you will also find a Zoroastrian temple and two historic churches. Austrian Airlines flies into Erbil, in Iraqi Kurdistan. Here, the Kurdish language is spoken, but in the rest of Iraq, Arabic is the main language. This turbulent country has many holy places, which attract millions of pilgrims every year - both Shia and Sunni. But there is also a wealth of historical gems in Iraq. Samarra is a UNESCO World Heritage Site. Its ancient ruins cover an area around 20 miles long, and the Great Mosque, built in the 9th century, has a beautiful spiralling minaret. The country's capital, Baghdad, is home to the Museum of Iraq. This amazing collection casts a light on 8000 years of Iraqi civilisation. Tel Aviv is the location of Israel's international airport. The coastal city of Tel Aviv began life in 1909 as a small settlement outside the ancient port town of Jaffa. These days, it is a large and vibrant city with a dynamic business culture and a fondness for partying. The bars and restaurants that line the seafront make for a lively night out. There is even a selection of nightspots on the beach itself. But if you are more interested in visiting the holy places, you will find it easy to reach Jerusalem by train or bus. In fact, the views en route are spectacular. One of the most iconic sights in Jordan is the ancient city of Petra. Carved from the red sandstone of the desert, its temples and tombs have appeared in many movies and TV shows. More than 1,000 years after Petra’s heyday, Crusader forces were building equally impressive castles in the region now known as Jordan. One of the most imposing is Kerak, which was captured by Saladin in 1189. But if you are looking for a wilderness experience, join a tour heading for Wadi Rum. This spectacular valley was the location of Lawrence of Arabia’s camp. You could even sleep under the stars in this magical setting. The Great Wall of China may not be visible from space, as some people suggest, but it is certainly an overwhelming sight when you view it from the ground. Imagine the effort that went into building such a mighty fortification 5,500 miles long! China is still astonishing the world today. Its explosive economic growth over recent years has given many of its cities spectacular skylines. The Shanghai Tower is the world’s second tallest building, but has the world’s highest viewing platform, at 561 meters. For a more grounded experience, visit one of the city’s traditional teahouses. Some are in beautiful old buildings that contribute to their atmosphere of calm. For the dedicated sun seeker, Red Sea resorts such as Hurghada in Egypt offer some of the most reliable tanning weather in the world. The water is also a pleasant temperature for swimming, and crystal clear. After a relaxing day on the beach, why not head into town and sample some delicious cuisine? Perhaps a seafood platter with a glass of wine. If your itinerary takes you to Cairo, the Pyramids of Giza and the Sphinx are a must. It is easy to see why the largest of these pyramids is considered a wonder of the ancient world. Composed of nearly 7,000 islands, Japan – the Land of the Rising Sun – is an archipelagic nation known for its stunning landscapes, food, and the way that it perfectly blends a unique, millennia-old heritage with an ultramodern streak. Fly around the world with Austrian Airlines and discover the wonders of Tokyo, of Osaka, or Nagasaki. Take the Shinkansen, also known as the Bullet Train, between cities in no time at all, and visit centuries-old pagodas in Udo or Kasai. Taste the finest sushi on Earth as it was meant to be had, and wash it down with some traditional chanoyu tea or sake. If you’re feeling adventurous, you can climb up to the top of Japan’s iconic Mt. Fuji – so definitive of Japan. Whatever your interests, Japan has all this to offer and more, so what are you waiting for? The Maldives are an archipelago of thousands of tiny coral islands. Some of them are only 200 meters across, and just a few meters above sea level. Lying on one of the many perfect white beaches, you could imagine yourself stranded on a desert island, except that you can request a cool drink at any time, or go for a scuba diving lesson in the bright blue waters of the Indian Ocean. The Maldives are an excellent destination for water sports, so why not try a spot of paddle boarding while you're there? It's great exercise and a lot of fun. With palm-fringed white beaches and a clear blue ocean, Mauritius is many people’s idea of an island paradise. You can explore the lush, forested interior by taking a guided hike in the Black River Gorges National Park. Stunning views and abundant wildlife make this a must-do experience. Mauritius is a volcanic island, and many visitors take a trip to see the crater of Trou Aux Cerfs. Naturally, it's extinct these days, so it makes a great location for a picnic. If you are looking for a lively night out, the most popular spot for locals and tourists alike is Grand-Baie, a coastal village where you will find bars, restaurants and dancing. Wander through the colorful bazaars of Tangier, visit the massive mosques of Marrakesh, or the palace of Rabat – Morocco has all of this and far, far more in store for the intrepid traveler. Fly with Austrian Airlines and come see the old and new world charm that resonates around every corner of Casablanca or the Alauite Royal Palace of Fez. No matter your interests, be they history or modern Moroccan culture and daily life, this country is not one to be missed. A beautiful landscape awaits – from the looming Atlas Mountains, to the southern sands, each with their unique wildlife and extraordinarily photogenic vistas. Phuket Island, in the south of Thailand, is a vacation paradise. White beaches, fishing villages on stilts, boat trips to secluded bays and snorkeling in crystal-clear water are the ingredients of an unforgettable stay. Be sure to visit the ‘Big Buddha’ – a 45-meter-high statue that gazes down from a scenic viewpoint in the hills. The Thais are a deeply Buddhist people, and Bangkok is the focus of their faith. The many gorgeous temples are some of the finest sights in the city. You should also make a point of seeing the floating market, which is a short boat ride away from the center of Bangkok. Austrian Airlines flies to ten destinations across Canada, so isn’t it about time you gave yourself an adventure? Maybe a spot of whale watching in Vancouver? Or trekking in the mountains of Alberta? And then there’s the Calgary Stampede – it’s billed as "The Greatest Outdoor Show on Earth", so why not give it a try? If culture is more your thing, head for Montreal. It’s Canada’s entertainment capital and has a definite old-world charm. Both Montreal and Quebec have the added attraction of being in the French-speaking part of Canada, which means excellent food! Whatever it is you have in mind, it is possible in Canada. From sea to shining sea, experience the United States of America with a little bit of help from Austrian Airlines. The US has it all – from gorgeous landscapes to bustling cities full of color and lights, just waiting to be experienced firsthand. Visit New York City with its iconic city skyline, Brooklyn Bridge and the Statue of Liberty. Travel across the country on the famous Route 66 that crosses the Great Plains and the towering Rocky Mountains. Explore the West Coast from misty Seattle to sunny Los Angeles. Spend some time gazing over the legendary Grand Canyon or camping in Yellowstone National Park. Try the unique Cajun cuisine of Louisiana or the delectable lobster of New England. With all this and more, there’s no shortage of fun and excitement to be had in the United States. Austrian Airlines welcomes you on board. 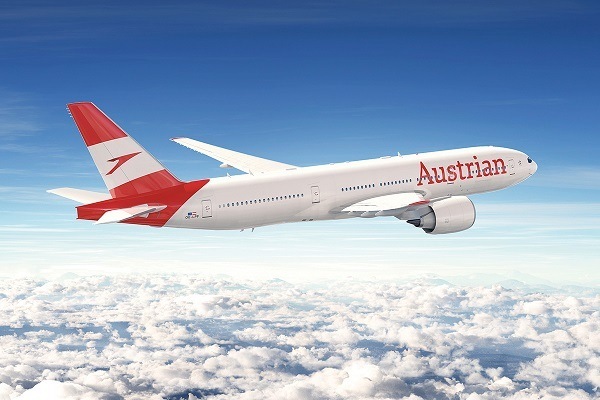 Thanks to our partnership with Lufthansa, Austrian Airlines is now a member of the largest airline company in Europe. You, being our customer, will especially profit from our large optimally matched network of destinations throughout the world. This can be carried out with a 25-minute transfer time via our hub in Vienna. Austrian Airlines is your expert and market leader in Central and Eastern Europe and links Vienna with more than 40 destinations in these regions. If you are taking a business trip, a city break, a holiday or participating in an international business conference, the wide range of flights offered by Austrian Airlines bring the most important ecconomic centres of Central Eastern Europe and interesting cities much closer. Book your flight with Austrian Airlines today and profit from our low rates and top service during our flights. How long into my pregnancy am I allowed to fly? Flying during a pregnancy with Austrian Airlines is allowed until 4 weeks bevor the due date. How long before departure time can I check in? With the Austrian Airlines Web-Check-in you can start checking in 47 hours before the planned departure time. How much is a seat reservation? The standard costs of reserving your seat vary depending on flight segment (Europe, Intercontinental short, medium and long) and your tariff (Economy Light, Classic und Flex) in a range from EUR 10 to EUR 35. Apart from the standard seat reservation, Austrian Airlines also offers seats with extra legroom, seats in the preferred zone and the Austrian privacy seat, all of which can be reserved for an extra fee. What do I have to consider with children travelling alone? Children between 5 and 11 are allowed to fly alone as “Unaccompanied Minors“. For a fee of EUR 60 in Austria and Europe or EUR 100 on intercontinental flights, Austrian Airlines offers a reliable supervision for children aged 5 to 11 travelling alone. Please note that apart from the general regulations there are special rules in France for Unaccompanied Minors. As flights for children travelling alone cannot be booked online, we are happy to assist you under +43 5 1766 1000! The transport of foldable baby buggies not heavier than 10 kg is free of charge. Non-foldable or heavier strollers must be checked in as baggage. Is there an on-board internet connection? Yes, the Austrian FlyNet, our on-board WLAN. Currently this service is offered on several select planes from our Airbus family for short and medium flights. Whether you want to check e-mails, send messages to your friends or stream your favourite video – with the Austrian FlyNet you’re online while flying high in the sky. After boarding, you can connect to the WLAN, and after reaching cruising altitude you can choose between three different service packages. Austrian Services are optional services, which you can add in order to customize your travel experience to suit your personal needs. Find more attractive flight offers for your favorite destinations easily online at our partner Lufthansa. Find further attractive flights and last-minute offers online at our partner SWISS.